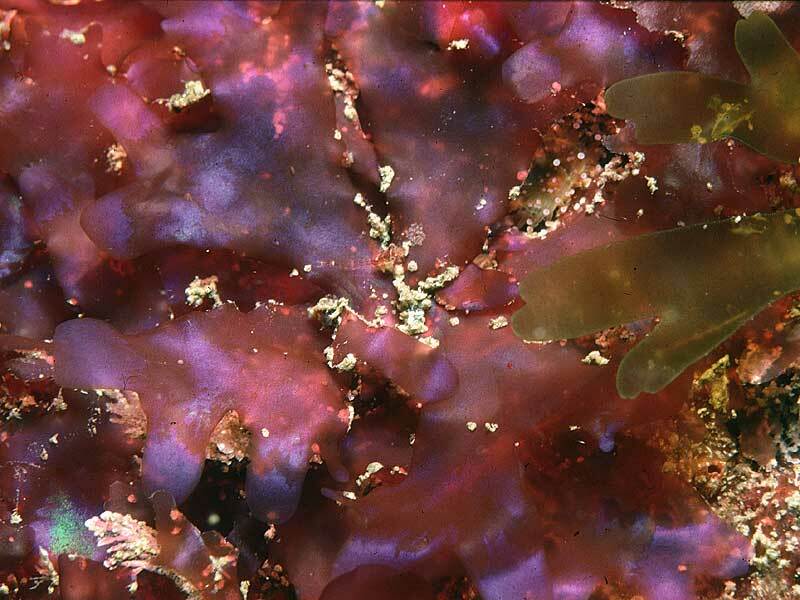 Description: Thallus foliose, attached by a short stipe with flat red fronds, up to 15 cm wide showing blue iridescence. Branching in fan-like manner, without veins. The apices of the branches are pointed and may reattach to the surface in older plants. Habitat: Common, although unrecognised for many years because of its subtidal habitat. Epilithic in exposed subtidal sites in clear water to depths of 30 m.
Distribution: Sublittoral in Britain and Ireland in large patches mainly on south-westerly coasts but recorded from the Shetlands. Similar species: Other species with fan-shaped blades. See Drachiella heterocarpa and Rhodophyllis divaricata. Key Identification Features: Thin fronds extending across rockfaces. Strong blue iridescence when alive. Site © M.D. Guiry 2000 - 2019. Important copyright notice: all text, design and photographs on this site are copyrighted by M.D. Guiry unless otherwise stated and all rights are strictly reserved. Click here for copyright information and contact. Website design: 249 Design Studio. Site maintained by M.D. Guiry (michael.guiry@nuigalway.ie). There have been 8736602 page loads since 1 January 2014 on 25 April 2019.